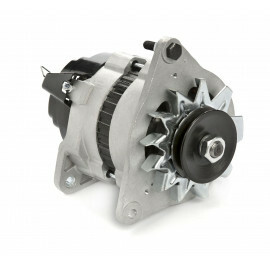 With our superlight AC Alternator conversion kit all Lucas C 40, C42 and C45 dynamos with negative earth can be replaced. You can benefit from the following improvements: Since the Superlight Alternator is lighter it uses less motor energy and provides you with more power for the road. Half the weight, twice the power! The Original Look of your classic car is untouched, our product looks like the old Lucas, just hidden inside is the up-to-date high tec. Even your old regulator remains in the car, so the update is not visible. Remove your old dynamo and take of the pulley, spacers and washers and fit them on the alternator. In some cases you need to drill out the pulley with a 17mm drill. Ensure that the pulley is gripped between the nut head and the spacer. Tighten the nut by holding the flats on the shaft end, never insert anything into the commutator. Remove field lead (F) and warning light (WL) from the Regulator and attach together. Remove dynamo lead from the regulator and attach it to the battery positive lead to create a battery positive feed. 1600 rpm 13 Ampere, 2000 rpm 21 Ampere, 2400 rpm 27 Ampere, 3500 rpm 38 Ampere, 5000 rpm 43 Ampere, 6000 rpm 44 Ampere, Maximum power output: 584 Watt, Voltage: 14,89 Volt, Compare with C40: max. approx. 22 Ampere, C40L approx. 28 Ampere. Half the weight, twice the power! 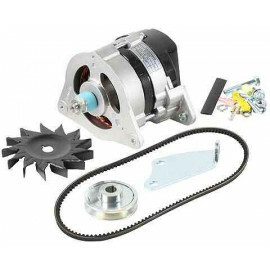 kit includes alternator, bracket, pulley, fan belt and hardware. It is necessary to convert the car from positive to negative earth. 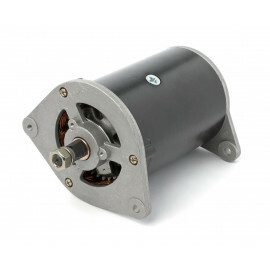 Our modern gear reduction, high torque starter motors are specially developed for classic cars. They use a powerful 1.5 kw motor running through a reduction gear box, turning the engine over faster, more powerfully and for longer. No more worries on the start line when the engine is hot. All starter motors are a replacement for the original unit.